Shafer Leadership Academy is, at its core, here to help people learn how to lead. Leadership is a lifelong journey of self-discovery and change, and Shafer Leadership Academy makes it a part of its mission to teach current and future leaders how to be collaborative, innovative, and future-focused. Mitch Isaacs, the CEO of Shafer Leadership Academy, emphasizes successful leadership within the scope of changing organizational values. In the 21st Century, a collaborative and innovative environment is essential to foster success within an organization, a community, and beyond. In a very clear way, Shafer Leadership Academy exists to provide community members with the skills and mindset to operate as leaders in a new century. They actively carry out this mission through the services they provide to the Muncie community and beyond. Shafer Leadership Academy’s community programs are their bread and butter. The organization began with a pilot program called “Emergence.” This program continues to be an important program in their repertoire, which also includes lunch and learns, one-day programs, and deep dives. But what makes Shafer Leadership Academy’s community programs in particular so special are their accessibility. Community programs at Shafer Leadership Academy are always either free or low-cost, and the organization offers scholarships to participants who want to participate but may not otherwise have the means to do so. 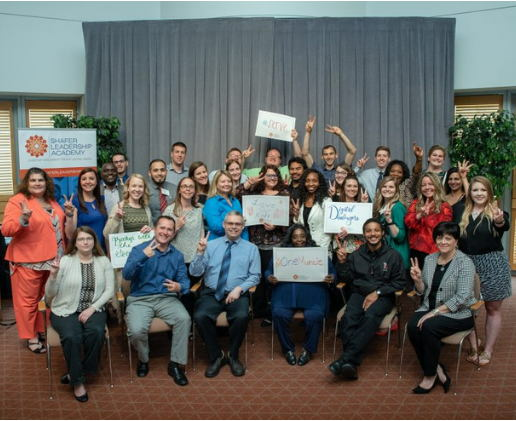 Because one of Shafer Leadership Academy’s values is their belief in the leadership potential of all individuals, the organization works hard to ensure that anyone who is interested can participate. In fact, the demographics that Shafer Leadership Academy serves is on-par with those of the Muncie community, meaning the organization touches a diverse amount of people. The success of Shafer Leadership Academy’s community programs is also clear when looking at other statistics. Out of 450 Emergence graduates, 75 percent have taken a leadership role in the community, 50 percent joined a not-for-profit board, and 40 percent have experienced a job advance within five years of graduating from the program. Community programs are what makes Shafer Leadership Academy such an asset to Muncie, but the organization also offers custom programs that include consulting services catered specifically to an organization. Mitch expresses that these services are his “fundraisers.” The revenue from these programs goes back into ensuring community programs are up-to-date, engaging, and open to all. Although Shafer Leadership Academy uses the revenue from their consulting services to provide free programs to the community, Mitch also expressed the importance of grants and donations for the future of the organization. So, when an anonymous donor came forward last year with a $10,000 gift to establish the Shafer Leadership Academy Endowment Fund at The Community Foundation to celebrate Shafer Leadership Academy’s tenth anniversary, staff members and volunteers at the organization were delighted. Not only does the establishment of this fund represent the good in Muncie, it is also an ode to the positive contributions Shafer Leadership Academy has made within the community. Like many other organizations, Shafer Leadership Academy understands the importance of being future focused. Nonprofits especially rely on stakeholders for financial stability, but Shafer Leadership Academy recognizes that life is unpredictable, and anything can change. That is why the endowment is so important: It allows Shafer Leadership Academy to find some stability, and with that, the ability to plan for the future. Although the endowment at The Community Foundation was only established for Shafer Leadership Academy last year, the organization’s relationship with the Foundation is long withstanding. The Community Foundation helped Shafer Leadership Academy get its start and has also provided grants for scholarship dollars to the organization for several years. In the future, Shafer Leadership Academy hopes to use the endowment as a continued source of scholarship dollars for program participants. Additionally, Mitch hopes that this endowment will allow the organization enough resources and energy to focus more on the role it can play in the future of the Muncie community. And Shafer Leadership Academy is not planning on going anywhere any time soon. They have just started the process of creating and implementing a new strategic plan that will carry the organization into the future of innovation, collaboration and leadership.